Last week, we learnt how God chooses to hide from the “learned and the clever”, those who obstinately hold on to their own ideas and rely on the sophistication of their own human reasoning, whilst, revealing His deepest most secrets to “mere children,” to those who humbly and obediently submit to the yoke of his will. Today, the theme continues within the setting of parables. The parables would prove equally enigmatic to the ‘outsiders’, those who regard Jesus’ mission with suspicion and even envy, those who take pride in their own reasoning and knowledge. But for those who follow him, those who count themselves as his disciples, the parables are lucidly clear. Today is the first of seven parables, and is commonly known as the Parable of the Sower. We will hear the other parables over the course of the next three weeks. What is useful to the reader is the Parable of the Sower comes with an explanation, which makes the interpretation so much easier, without which, we would have to speculate the meaning of the metaphors and allegories used. Yet, almost all biblical scholars agree that the explanation was not part of Jesus’ original parable. One of the distinguishing features of the gospel parables are that they are open-ended, allowing for a variety of interpretations. Because the parable allows for a variety of interpretations, depending on which ‘character’ is chosen as the focus, it has been called by various names. Based on the allegorical interpretation given in the text, it would seem strange and misplaced to call this parable the Parable of the Sower, when in fact, it would have been more appropriate to name it the Parable of the Soils. Today, I would like consider it under its proper name, that is the Parable of the Sower, by focusing on the human protagonist of the story, and secondarily consider it as the Parable of the Seed, the raw material which the Sower used. Let’s begin by considering it under the title of the Parable of the Sower. A sower was a familiar character in rural Palestine during the time of Jesus. In today’s modern age where horticultural technology has facilitated efficient large-scale production of farm products, the idea of a single Sower unsystematically scattering seed seems anachronistic and counter-productive. To the audience of Jesus, and to our modern economic sense of optimising production whilst minimising wastage, the action of the Sower seems sloppy and wasteful. It is clear to all that the Sower represents God or Jesus, whereas the seed is the Word of God. From this perspective, the story focuses on how God acts. God is like a generous farmer, who indiscriminately sows seed on every type of ground. It is God who makes the sun rise on the bad and the good, and causes rain to fall on the just and the unjust. Noteworthy is the point that God knowingly scatters the seed on all types of soil. His action is deliberate and there is nothing accidental about it. God offers the Word to every person, regardless of their potential for accepting it. Although not all will accept the Word and bring it to fruition, it is offered to all. He is not daunted by failure nor holds back because of a negative assessment of the soil’s capacity to produce a favourable crop. The soil does not set the agenda. 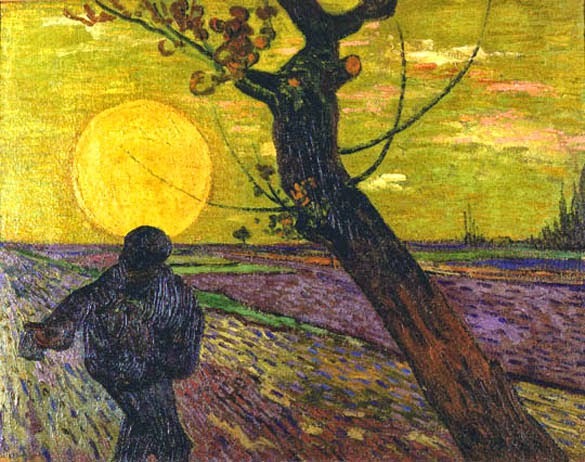 The Sower does. Just like the Sower who appears to scatter his seed carelessly and recklessly, Jesus’ investment in his disciples who look similarly unpromising would appear to be sheer madness. Here is a Messiah who squanders his time with tax collectors and sinners, with lepers, the demon-possessed, and all manner of outcasts. Yet he promises that his generous and bountiful sowing of the word will produce an abundant harvest. What is remarkable about the story of the gospel, which is accentuated in today’s parable, is that in spite of these failings, Jesus does not give up on the disciples in spite of their rejection, their misunderstanding and their infidelity. In fact, he continues to invest in them, even to the point of entrusting the future of his mission to them. We might consider the implications of this parable for how we engage in sharing the Word today. Too often we play it safe, sowing the word only where we are confident it will be well received. A ‘soft version’ of the gospel or the Gospel of Nice, one which says little about sin or the cross, has become staple food for the masses. Frequently, we hear the claim that cultural accommodation is “needed” if the Church is to have any hope of surviving in our modern and secular culture, a world which is increasingly intolerant of moral boundaries for sexual expression. Many believe that the old way of proclaiming the gospel is not congruent with our present culture, thus necessitating a change in both the method as well as its content. Pandering to a new generation of listeners ultimately suggests modifying the core message of the gospel to suit contemporary ideology. We tamper the edge and moderate its demands. But as the different kinds of soil did not determine the Sower’s manner of sowing or his choice of seed, likewise the cultural norms and personal likes and dislikes of the audience should never justify altering the content of our message. It is the gospel of Christ that we must preach, and no other. As a preacher of the Word, a Sower of Seeds, I am keenly aware of the constant dilemma that is set before me. Do I pander to the audience? Do I dumb down the message because I fear the congregation may not grasp the depth of the message or may feel insulted by its demands? Should I be held hostage by an approving or disapproving audience? Rather than trusting in the power of the Seed, the Word of God, there are times, I’m tempted to alter the ‘Seed’ to accommodate an easier planting. Therefore, the Parable of the Sower becomes an excellent reminder - Our duty as a preacher is not measured by the character of our hearers, but by the command of our God. We are servants of the Word of God, not its masters. We are bound to preach the gospel, whether men will hear, or whether they will shut their ears. The Seed is not some eloquent human speech but the Word of God. We are merely the medium. The call is to fidelity and not to novelty. The communication of the gospel is intended for men’s salvation, not for their entertainment. But the parable also provides us with a profound consolation. We are reminded that no matter how good we are at sowing, and no matter how good the seed is, you won’t get a 100% germination rate. So those called to share the Word with others should not be overly grieved when not everyone receives their message, nor should we be too concerned if our son or daughter seems unconverted or unrepentant after forty years of tireless reminders and pleading. There’s more to sowing than the sower and the seed, there is the reception that the seed finds when it is planted. It is noteworthy that Jesus himself recognises that not all would be able to ‘understand’ or accept his message. Jesus' approach to mission is quite at odds with our usual play-it-safe instincts – we expend a great amount of time deliberating over the costs, discussing our exposure, weighing the risks and finally come to the conclusion that we should stay with the familiar and tested. But Jesus gives us both the freedom and the challenge to take risks for the sake of the gospel. He endorses extravagant generosity in sowing the word, even in perilous places. Though we may wonder about the wisdom or efficiency of his methods, Jesus promises that the end result will be a bumper crop.